Hope you're having a good Memorial Day Weekend. Did you know that 53% of Americans will be barbecuing this weekend? Will you? I posted my updated Memorial Day Crime Fiction list a few days ago, so I thought I'd update my Barbecue Mysteries list, too. So many ways one can murder someone at a barbecue, from the sauce to the skewers to the grill, not to mention the tiny wires on the barbecue brush (true crime!). Here's an updated short list of Barbecue Mysteries. Let me know if I've forgotten any titles! 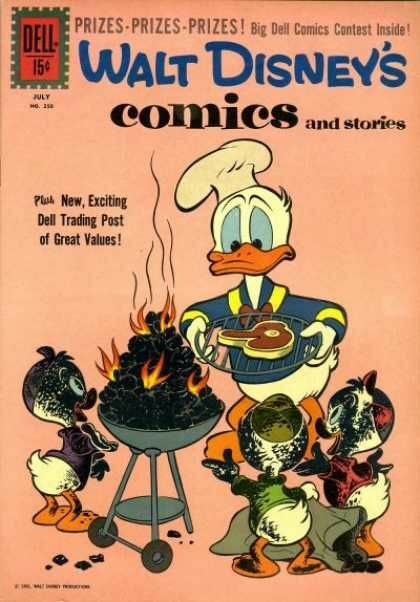 The illustration on the right, a cover from a Donald Duck comic book, is a bit odd, don't you think? Had to post, though. Want a little chocolate on the barbie this weekend? I have not heard of any of these authors before. I will be checking them out and probably adding to my vast TBR pile.